How to get on the right train in Germany? Always double-check platform information before you board a train. Reader Paul shared his story how he nearly missed his train because the train departed from a different platform on his travel day. Unfortunately, it happens occasionally that trains don't leave from the scheduled platform as announced on timetables and sometimes even on your train ticket. Maintenance work, delayed trains and other factors are responsible that trains sometimes depart from a different platform. How to avoid that you end up on the wrong train? 1. Check the electronic information board on the entrance at a train station. These boards list departure time, train number, the platform (Gleis) and the final destination for trains that depart during the next 30 to 60 minutes. When you see a news ticker entry to the right of your train information read it carefully. It tells you if a train is late, if it doesn't stop at a certain station, or if it leaves from a different Gleis than mentioned on the timetable. 2. 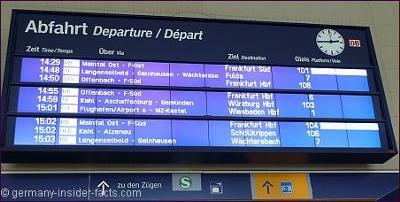 There is also an announcement board on each platform that gives info about the next train to depart from that Gleis. On busy train stations trains leave quite frequently, so when you arrive early, look and get on the right train. 3. Smaller train stations often have only two rail tracks, so sometimes you just see a sign that shows the final destination on each track. So it is good to know in which directions your train goes. 4. Regional trains, S-Bahn, U-Bahn and buses usually have the final destination on front of a train. So, the printed train schedules / timetable / Fahrplan can be helpful for first information. And yes, they usually list trains operated by private companies as well. However, the timetables only get updated once or twice a year, so the info boards show the most current facts. The main change of timetables (Fahrplanänderung) for all public transport happens in mid-December every year. Unfortunately, this means that prices for public transport often rise at that time as well. Try to arrive early at the station. Don't hesitate to ask train conductors or fellow travellers on the platform. German Rail - Information about trains, tickets & local transport. Rail Passes - When is it useful to travel with a Germany rail pass? Bahncard - When is a Bahncard better than a rail pass? Archived Train Travel Questions - More train travel tips and questions by other readers. Although I think that travelling by train in Germany is fairly easy, I also realise that it can be difficult for travellers from abroad when they don't understand all the signs and info written in German. As for the ticket machines, these can be overwhelming, indeed. I admit, I couldn't post any instructions by heart. I thought to give some instructions, however, there are so many different machines around. Apart from the Deutsche Bahn ticket machines there are also those of the local transport associations. They all are different. Deutsche Bahn always add more features to the machines, obviously they want us travellers to become "independent", and then they can reduce staff at the ticket centres. The good thing is that the modern machines offer instructions in different languages. But I admit, it takes time to find out how to just get a train ticket. Very good advice about trains schedules! The advice about locating and understanding train schedules is very helpful!!! Had I known this when I was last in Germany, I would have saved myself a lot of anxiety. I did what I usually do, asked for help, and was never misdirected but now I could be much more self-sufficient because of the information given here. THANKS FOR POSTING!!! Perhaps someone can give advice about purchasing tickets from the automated machines. I always needed to have actual "standing-next-to-me" help doing this, I could never remember verbal instructions long enough to complete a transaction. Thankfully, those who helped me were so generous and so kind to give me their time as they helped me purchase my ticket.